We’d love your help. Let us know what’s wrong with this preview of Unlikely Hero by Sian B. Claven. In a world where transport is the main control of the universe, one spacehiker is tasked with the unfortunate job of helping two refugees get across the civilised universe without being detected. The only problem is it sounds easier than it’s done. With no trust between them, Jasy must get Mark and Lizzie the hell out of dodge for a reason they won’t tell her. While Mark a In a world where transport is the main control of the universe, one spacehiker is tasked with the unfortunate job of helping two refugees get across the civilised universe without being detected. The only problem is it sounds easier than it’s done. With no trust between them, Jasy must get Mark and Lizzie the hell out of dodge for a reason they won’t tell her. While Mark and Lizzie must place their safety, their lives, in the hands of someone who breaks the law on a daily basis. Another amazing book by author Sian Claven. 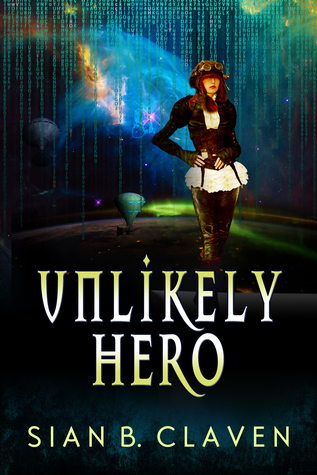 Unlikely Hero takes us on a interplanetary space adventure with our tough as nails space hiker Jasy as she's tasked with secretly transporting a pair of secretive strangers through several planets and into deep space. This exciting, and quick read will have you on the edge of your seat for the next installment. I give this a 5/5 star rating .